Where do you pick up when your life has fallen apart? Kate Kristopher was last seen at her half-brother Ulisses’ home, on her knees, clutching herself as she stared at the guts pouring out of her half-brother Kalil’s abdomen. Her horrified stare was unbroken as her father, long thought dead, made his presence finally known and reached out to her. June’s Shutter #22 ended with a “Red Wedding”-esque massacre while Kate’s family and friends were gathered for dinner, and the cliffhanger left readers with the devastating image of Kate surrounded by the maimed, bleeding bodies of those she loves just before the reunion she had been eagerly anticipating. So what happens now? How does Kate come back from this? She goes back to the beginning. Shutter #23 returns to where the series started, reflecting moments from the very first issue of Shutter while using almost the exact same panel layout. (Only two panels differ, and even then the difference is slight, with the panels being angled in #1 and flat in #23.) Kate needs a reboot, and going back to her debut is an extremely clever way of giving her a fresh beginning, easing readers into her new circumstances by putting them in a familiar context. There’s an undeniable sense of déjà vu, but Shutter #23 isn’t telling the same story because Kate isn’t the same person she was 22 issues ago. 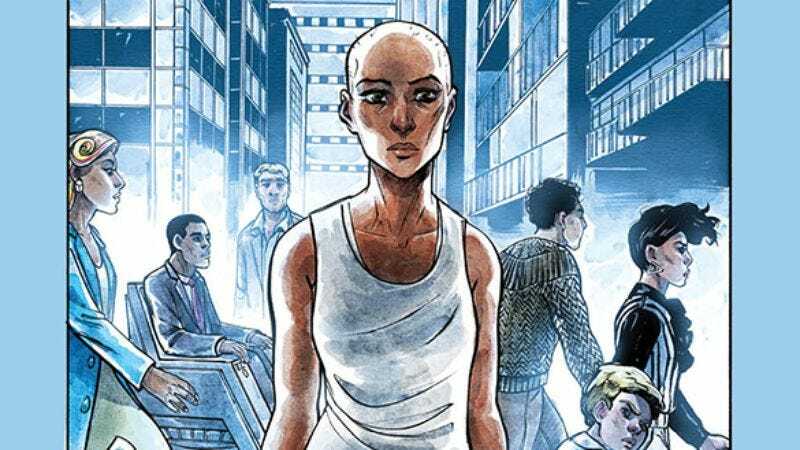 By revisiting the first issue, the Shutter creative team highlights just how much Kate’s life has changed over the course of the series. It takes a few pages to realize what’s going on, but once the reflection clicks, it’s hard to fight the urge to pull out that first issue of Shutter and see how the moments in each chapter relate to each other. This book’s creative team is constantly experimenting with the comic-book form, and this week’s issue is another outstanding example of how writer Joe Keatinge, artist Leila Del Duca, colorist Owen Gieni, and letterer John Workman take advantage of the unique properties of comics to elevate the storytelling. No other visual narrative media can do what Shutter #23 does. Theoretically a film or TV show could replicate all the shots and story beats of an earlier installment to advance a new story, but not with the ease of this issue. The motion of those media also changes the effect, and the static nature of the comics page makes it easier to analyze how moments relate to each other, not just from panel-to-panel, but in the larger page design. Series of photos or art pieces could also attempt a similar narrative structure, but they lose the language aspect that helps reinforce connections. It’s certainly a challenge for the Shutter team to make a new story that fits within the confines of an old one, but it’s not nearly on the same level as the challenge of attempting this type of structure outside of comics, which provide a concrete blueprint that can be easily replicated. Everyone has specific beats that need to be hit, which have already been broken down into individual panels that make it simpler to align the script, linework, coloring, and lettering. It’s also easy for readers to examine the connections between the issues if they have both Shutter #1 and #23 readily available. Assuming these are physical copies, all it takes to start the examination is opening each issue to their corresponding pages. Shutter #23 opens with a two-page splash of mythical Titans running across the surface of the moon, indicating how the scope of the book has expanded compared to the accompanying splash in issue #1 showing a young Kate running on the moon by herself. Those Titans continue their run across the cosmos in the panels that were used for credits in #1, and the panels where young Kate talks to her dad now show adult Kate learning from her new father figure, a boxing instructor who is helping her regain her strength after the catastrophic events of the last arc. Even though Kate and Cid’s dynamic isn’t explored very deeply in the script, their father-daughter relationship is established by how those panels relate to Kate’s bond with her biological father, Christopher, in the first issue. Sending readers back to the series’ opening sequence also serves as a reminder of Shutter’s major themes, specifically self-realization, embracing the wonder of the world, and the importance of family. Kate is in a tough emotional place, but opening with the majestic Titans racing through the stars loudly announces that these bleak times haven’t killed the marvels of the universe. Those final moments of Shutter #22 were an emotional gut punch, but the creative team makes a wise decision to not linger in misery for too long. Issue #23 is about restoring Kate’s hope and power, and she does that by reconnecting with the people that mean the most to her. The city outside Kate’s window is foggier than the shining vista she looked out on in Shutter #1, but despite the drearier weather, there’s much more love surrounding Kate in the present. Take that establishing shot of New York City: In #1, a couple sits on a bench, a single man walks his dog, and a mama pterodactyl sits on her eggs. In #23, the couple is expecting, the solo man has a new partner, and the pterodactyl plays with her hatched offspring. The ox who sits next to Kate on the train reading a newspaper by himself in #1 is now reading a book to his child, and the two strangers sitting next to the ox in #1 have now paired up. One of the weirdest couplings appears as Kate heads to the cemetery where her father’s gravestone is located, and a musician carrying an instrument case in #1 is now in a relationship with an anthropomorphized violin. All of this loving imagery is building to the moment when Kate reconnects with her father and siblings, who have survived their deadly dinner with varying degrees of injury. Christopher has a lot to answer for, and he takes this opportunity to apologize for the mistakes he made in his efforts to protect his children. He’s not looking for forgiveness; he just wants his children to know that he loves them and is willing to do whatever he needs to do to fix things in the future, even if that means stepping out of their way. The corresponding scene in issue #1 is Kate alone at her father’s gravestone, feeling aimless until a surprise attack reveals that she has a family she doesn’t know about. Jump forward 22 chapters and Kate’s found her family and her purpose. Instead of an attack, this visit to the cemetery ends with healing, and the final image of a calm, sympathetic Kate hugging her crying father projects an optimism and compassion that is a powerful contrast to both the final image of #1, showing an unconscious Kate in the arms of her robot attacker, and #22, showing a very conscious Kate surrounded by death. She’s been trying to find the elusive concept of “home” for this entire series, and she gets there at the end of Shutter #23 by reuniting with her family. She’s centered, she’s focused, and she’s ready to get in the fight again, backed by the support of a family that will give her the strength she needs for this final stretch of her journey.